OK- well, not really a dancing Diva, just a little girl all dressed up! This is not the sharpest of photos but it will do. I was around 10 or perhaps 11 years old here when my Mom sent me for Ballroom Dancing, perhaps to Louise Crowley and her sister. 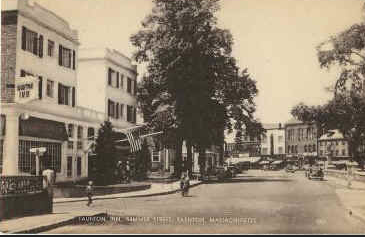 We had a demonstration at the Taunton Inn downtown. This dress-up long gown was for a dancing exhibition there. Exciting for a little girl to even have a corsage. 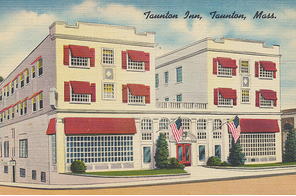 The Taunton Inn was a big deal for me, a lovely place for teas and special events. All the time I was growing up, this is the only time I recall going there. 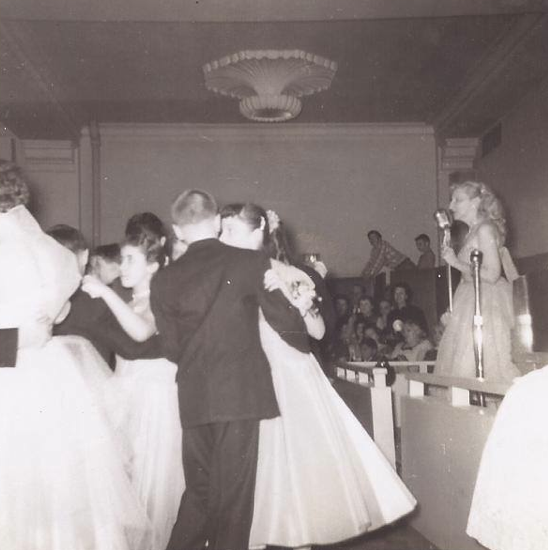 I can almost feel the touch of the taffeta dress (taffeta being very in at the time,) and I remember that it was a peach color. No one left to verify, unfortunately. So, peach it shall be. We learned the waltz, the foxtrot, the quickstep....remember the box when you did the foxtrot...or was it something else?? I have no recollection of my partner. Below is a photograph from the I'm From Taunton Facebook page, courtesy of a Joanne Simpson Brehner post. Another dancing exhibition at the Taunton Inn. Good photo of Ms. Louise who with her sister taught so many little Tauntonians a bit of graceful movement. 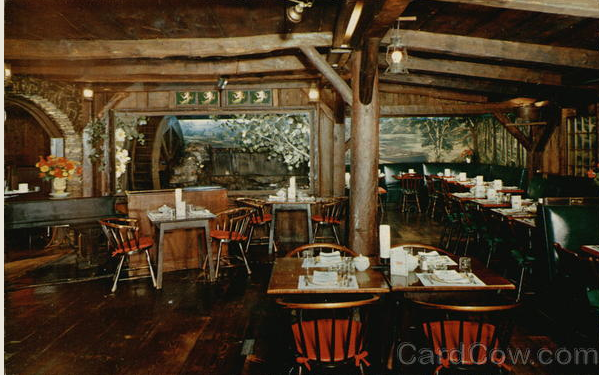 Above Herring Run restaurant room at the Taunton Inn in the 50's. Back in the day, the Inn was quite elegant. you can see it on the left. My guess is that it was destroyed by fire. elsewhere earlier on in the history of Taunton. Another photo above of the Inn from Flickr on the Net. This is the Inn building as we knew it. I would guess, from the cars, this would have been in the 40's or 50's closer to the time of my Ballroom extravaganza at the Inn. Below another postcard, date unknown. Today the Inn in now Marian Manor, a nursing home, I wonder if any of the elderly folks there dream of the Inn, indeed Taunton, in its prime. I feel it is right that it is a caretaker of memories as well as of people. time of rock 'n roll sort of stole it all away. Sandy, I was a student of Louise Crowley for almost 16 years and fondly remember the "Reviews" at the Taunton Inn. Joanne Simpson was in my tap class, and we were friends for a long time. I was Carol Read back then. Small world. Great pictures! 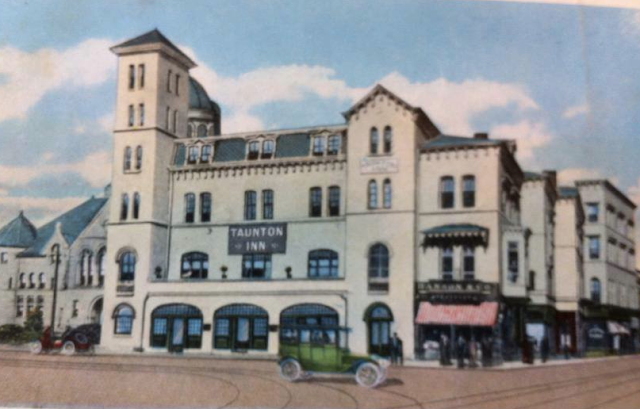 You have two different Taunton Inns . One was on the green next to the courthouse and burned down and the other is now Marion Manor. The one that is now Marion Manor had the Herring Run. My parents wedding reception was there in 1947.